The recent evolution of information and communication technologies (hereinafter ICT) has led to fast paced developments and changes for online learning education/training (Fasihuddin, Skinner & Athauda, 2013). In today´s globalized world, knowledge-based economy with dynamic progress places competitiveness (Competitiveness is defined by the World Economic Forum as “the set of institutions, policies, and factors that determine the level of productivity of an economy, which in turn sets the level of prosperity that the country can earn”.) as a relevant element for many countries and sectors. Both competition and information sharing are the drivers of the knowledge-based economy (Zhang, 2003). In fact, more than 100 elements are considered as determinants of productivity, fundamental for improving competitiveness. These factors are grouped by the World Economic Forum in the Global Competitiveness Report into 12 pillars: institutions, infrastructure, macroeconomic environment, health and primary education, higher education and training, goods market efficiency, labour market efficiency, financial market development, technological readiness, market size, business sophistication, and innovation. According to the stage of development of the economy, each one of these factors are more or less relevant. Under the recent evolution of business and ICT, technological readiness, business sophistication and innovation are crucial for the economic development (Schwab, 2015). By technological readiness, the agility to adopt existing technologies for improving the productivity is meant, especially regarding the capacity to fully leverage ICTs in the activities and production processes. This way, efficiency is improved and innovation is enhanced. Having access to advanced products and blueprints and the ability to absorb and use them is crucial for the firms aiming to be successful. Higher education and training are generally of great relevance, but business sophistication and innovation are playing a very important role, especially in the case of countries that already have exhausted, to a large extent, the more basic sources of productivity improvements as the first 10 pillars considered in the Global Competitiveness Report (Schwab, 2015). The quality of business networks is extremely relevant as opportunities for innovation in processes and products are easier to be created when companies and suppliers are taking advantage of efficient networks. Under these circumstancies, entry barriers in the market are reduced allowing this way the entrance of new firms. and the intellectual property´s protection. Within the context of the current economic crisis and the subsequent political agenda austerity measures were requested by the European Union and the International Monetary Fund to a large amount of countries, especially Europeans. These measures affected particularly education, research and development field due to the budgetary reduction. Therefore, education has rise in cost since 2009 onwards whilst also, unfortunately, in some cases decreased in quality (OECD, 2012, 2013b). The consequences of this context are not confined to education. Additionally, the labour market has shifted in many countries. Unemployment has soared, in particular youth unemployment, which was, and still is in some cases, concerning. In fact, youth unemployment seems to keep policy makers awake at night (OECD, 2013a). Solutions to unemployment are not easy to design or to implement when the economy is facing cascade drawbacks (as in the period 2009-2016) and when expectations of the society are above the possibilities due to the labour market status before the recent crisis compared to the one of today. In this sense, labour policy and its reform had a determinant impact on labour market across Europe. This new and (potentially) unstable economic situation has led towards shifts in the education system with a renewed focus on developing curriculum to be responsive to the labour market. ICT has allowed many people to access education particularly as a growing number of prestigious universities experiment with new trends in open learning such as Massive Open Online Courses (MOOCs). On one hand and given the knowledge-base economy, innovation and improvement of education through open and online education. In this sense, MOOCs could be an excellent option for promoting lifelong learning. On the other hand, unemployment might be also tackled by matching the needs of the labour market and the skills and aptitudes of the majority of university graduates. Also in this case, MOOCs can be (at least partially) a good solution. Stimulated by the prospect of global recognition and huge numbers of international learners, more and more higher education institutions (hereinafter HEIs) are providing MOOCs. Consequently, the number of MOOCs available is still increasing. By the end of 2015, approximately 4,200 courses were offered by 500+ universities to 35 million students. This has increased by 2016 to 6,850 courses by over 700 universities to 58 million students (Class Central, 2016). This growth is to a large extent related to efforts of European institutions. Jansen & Goes (2016) report that four independent surveys indicate that over 45 per cent of HEIs in Europe intend to offer MOOCs. This is in contrast to the USA where the number of HEIs that either offer a MOOC or plan to do so has remained stable at 12-13 per cent for the last three years (Allen & Seaman, 2016). This raises the question why so many European institutions are involved and how MOOCs are used for lifelong learning opportunities and the business training needed. The latter is part of the BizMOOC project and to some extent addressed in this report. Despite the fact that MOOCs are offering a complete course free of charge by definition, there are monetary costs and benefits associated with it. Several stakeholders are associated with the creation and the distribution of MOOCs as well as research and further services beyond the course itself. The diversity of MOOCs and players behind it makes it thus difficult to apply a universal business model to MOOCs. The rapid growth in the MOOC market leads to the influx of new stakeholders, bringing in new services, sponsorships, customers, cross-financing models etc. in the whole world of MOOCs. Currently, there is also a trend towards an increasing amount of corporations using MOOCs or the format of MOOCs for professional development activities, which might not only increase the revenues and business opportunities in the market substantially, but also challenge the open education approach. As well as in the case of HEIs, the reason of developing MOOCs is not the immediate achievement of profits, but using them as a tool for various objectives. Jansen & Schuwer (2015) report that the most dominant objective is to increase institutional visibility and using MOOCs for reputation reasons. But also using MOOCs as innovation area (e.g., improve quality of on campus offering, contribute to the transition to more flexible and online education, improve teaching) and responding to the demands of learners and societies are indicated as important objectives. Marketing and brand awareness by collaborating with high ranked universities increasing this way the visibility and reputation of the organisations involved. Summing up, in the current knowledge-based economy characterized by industrial change, globalization, increased intensive competition, knowledge sharing and transfer, and ICT revolution, learning is one of the most indispensable activities (Zhang, 2003). Education and training worldwide is offering huge opportunities for business that might be further exploited by organisations. The business community compared to educational system experiences the economic and labour dynamics at a faster rhythm. For transferring the rapid responses to the educational offer, university-industry collaboration is recommended as it facilitates updated learning and knowledge acquisition offer (Patru & Balaji, 2016). At this point, the business community is playing a crucial role in aligning the skills of learners (being students, employees or unemployed people) to the labour market needs. This possibility is rather tempting in the actual labour context. The level of familiarity of the interviewees with the MOOC concept is rather low. Almost three quarters of the organisations interviewed were already involved in online professional development, especially in Western European countries, but a very low percentage of the interviewed organisations are involved in MOOC related activity. Despite being facilitated online, MOOCs were perceived by organisations to be a good way of increasing learning opportunities to individuals, mainly because many MOOC are facilitated. MOOCs have the potential to widen access to education by offering learning opportunities to people previously unable to access Higher Education. The main benefits of MOOCs underlined by interviewees were in relation to their application within Human Resource Development and as a customer training, marketing and recruitment tool. For organisations which are already applying eLearning, MOOCs could become a core component of Human Resource Development (HRD) online training, for example, or at least complement existing resources and materials. MOOCs were perceived by interviewees as having the potential to transform current learning environments in companies. MOOCs are expected to have a more practical focus in order to serve daily business activities and tasks. Furthermore, they are expected to provide updated and practical knowledge/information, in conjunction with expert guidance of the field covered. Even if MOOCs seem to contribute to improving communication between and with learners, they are not perceived to increase the employability of those who have never had a formal job or have a low level of formal education. MOOCs are perceived as contributing to learner network growth and facilitating access to up-to-date and high quality information, which could make the difference when learners are looking for a new/better job opportunity. MOOCs are not just a way of reducing employer´s training costs, but they could also be a complementary tool for higher education, vocational education and lifelong learning as well as a complementary education tool that might facilitate continuous professional development of the employees. MOOCs are considered by the interviewees to be suitable for large organisations, public organisations, secondary schools, higher education etc., but their perceived needs will vary. MOOC are perceived as enabling access to highly sophisticated content at a low cost or even free-of-cost at the point of use. A large number of organisations surveyed are considering MOOCs as a new and free way of training their employees. Interviewees highlighted the potential for collaboration between higher education institutions and business in relation to MOOC focused on a range of topics including soft skills and technical expertise. Interviewees highlighted the role of policy (both at a local and national level) to increase engagement with and in the production of MOOCs by a range of organisations and initiatives. Despite being a relatively new phenomenon, Massive Open Online Courses (MOOCs) have started to be employed not just within the Higher Education system, but also within a corporate context for recruiting, the training of new employees, Human Resource Development (HRD), marketing, and even brand awareness (Grossman, 2013; Iversity, 2015; Radford et.al., 2015; Sreeleakha & Manikandan, 2015). As part of the BizMOOC project, an in-depth analysis was carried out during the first phase of the project in order to identify reasons why businesses/organisations, universities and society/labour force are not fully part of the MOOC movement. Although there is a high level of interest in MOOCs since their introduction, MOOC still remain relatively unknown and their creation or use is perceived as being inconsequential and even beyond the capacity of many organisations, education institutions and parts of society. Under the era of a tremendous evolution of information and communication technology (ICT), which is integral to many facets of our lives, the low or zero penetration of MOOCs in Easter European countries and the corporate world to date is somewhat surprising. However, in 2015 – compared to 2014 -, an increase of 13 per cent was observed in companies interested and feeling comfortable incorporating MOOCs into their learning platforms (Schwartz, Bohdal-Spiegelhoff, Gretczko & Sloan, 2016). This report aims to identify the reasons underlying the varied use of MOOC both geographically and contextually. In addition, it aims to identify the main opportunities and barriers to maximising the potential of MOOCs within the business community at the European Union level. Ability to obtain and retain close proximity to the phenomenon under study. Moreover, despite the focus on quantitative methodologies in business research, qualitative methodology is also used to complement this (see table 1). Table 1. Comparison of quantitative and qualitative. Source: Wai-chung Yeung (1995) based on Bryman (1988). Qualitative interviews are a potentially powerful means of exploring the intricacies of different sectors and subsectors (Broom, 2005). Within the context of this study, a qualitative approach offers different means of exploring the subjective and complex experience of the business community and other organisations, for example in relation to decision making processes both for day-to-day activities and strategic planning. In order to determine the reasons why the business community (including research institutes, NGOs, industrial associations, etc.) are not established players in the MOOC movement, a semi-structured in-depth interview was developed. This style of interview was chosen due to its flexibility, as it allows open dialogue to occur, enabling discussion beyond the parameters set by the set interview questions. A short introduction to the concept of Massive Open Online Courses (MOOCs) and the perception of the interviewees of this new phenomenon. More specific aspects of online courses and MOOCs. Identification of the availability and interest of the organisation to use, offer and produce MOOCs. Needs (and/or interest) in collaborating with other organisations on MOOCs. Identification of the topics and services that are a pre-requisite to an organisation working with others to produce MOOCs. The interviews were carried out with representatives of multinational companies, small and medium enterprises (hereinafter SMEs) and even micro SMEs (with less than 10 employees) as well as research institutes or industrial associations, among others. The geographical diversity of these organisations revealed a range of different perceptions and approaches to MOOCs in addition to highly varied knowledge levels and experiences of this type of online course. 56 interviews were carried out by 11 BizMOOC project partners with companies located in 11 European countries. Interviews were carried out by 19 persons from eleven organizations from the BizMOOC consortium between 1.4.2016-15.10.2016 via Skype, phone or face to face. However, given the international nature of many of the organisations involved in the interviews, the interviews are arguably representative of businesses in 80 per cent of the countries worldwide (when taking into account all countries where the participating organisations are active, e.g. including subsidiaries). Table 2. Summary of Research Design. Source: BizMOOC. All European countries which joined the European Union (EU) since the enlargement of 2004 onwards and countries which are not yet members of the EU were included. The main aim of the analysis of data collected via semi-structured interview was to identify the main potentials and barriers of MOOCs in the business community at European level. For the purpose of statistical analysis four different categories (each one of them including several discussion items) were derived from the interview outcomes: (1) awareness and perception of MOOCs; (2) involvement in online and MOOC activities; (3) Expectations, reasons, benefits and barriers to engaging with or creating MOOCs; (4) opportunities and interest for collaboration with other institutions. In accordance with these four different research categories, we present the corresponding results in the following sections. Given the main objective of this analysis, the first step was to determine the familiarity of the interviewees with MOOCs. As stipulated in the Table 3, only half of the organisations participating in the interviewing process are familiar with MOOCs, with the majority operating in Western European countries. It is worth mentioning that out of the organisations interviewed, only 14.28 per cent of those who were familiar with MOOCs prior to the interview, actually offer/produce MOOCs themselves. Table 3. Familiarity to MOOCs of the interviewees. Source: BizMOOC based on in-depth interviews. To help facilitate discussion around the concept of MOOCs, this definition was given to all interviewees to consider. 94.64% of those interviewed as part of this research agreed with the definition provided. It is important to note that more than half of these were already familiar with MOOCs. Table 4. Geographical distribution of organisations agreeing with the Jansen & Schuwer (2015) MOOC definition. Source: BizMOOC based on in-depth interviews. The characteristic “for free” does not seem to be an essential component of MOOCs as many are not completely free of charge (for example they might charge for certificates of completion). This change in approach was described as being akin to a “freemium” business model (in which the basic course is free at the point of use, but additional services such as certification are paid for). The definition could be developed further by the inclusion of examples showing what kinds of contexts could benefit from MOOCs. Finally, it is worth noting that several interviewees expressed concerns if high quality-learning experiences of courses can be achieved by offering them fully online. In an era of ICT, where online courses are no longer a new trend, many organisations (multinationals, SMEs, NGOs, public institutions, etc.) are making use of the advantages offered by the Internet with regard to professional development. According to our sample, around 71 per cent of employees at the organisations interviewed are using online professional development materials including MOOCs. The majority of these organisations are located in Western Europe where eLearning is used more extensively than in Eastern Europe. Moreover, out of the organisations interviewed, 28.57 per cent are using their own platform, webinars or video tutorials for training their employees. About 21.43 per cent are using blended training approaches and about 17.86 per cent are already using or promoting the use of MOOCs among their employees. Table 5. Organisational involvement in online professional development (by geographical location). Source: BizMOOC based on in-depth interviews. Our research revealed that there is a high level of organisational engagement in online professional development, particularly in Western Europe where over 76 per cent of the organisations surveyed reported using and/or creating online education activities. Out of the organisations based in Eastern Europe, 63 per cent are involved in online professional development. Despite the high levels of engagement, there is undoubtedly room for encouraging further engagement in online professional activity in both regions. The evolution of ICT and the personalisation of services, including education and training have resulted in important changes in the needs, requests and expectations of learners. Education and training is no longer confined to face-to-face classes. One interviewee noted that training is now highly personalised and can be tailored to the level, needs and wishes of the learner and delivered in a variety of ways including face-to-face and online. Applying theory to practice was the main desired outcome from all three types of courses noted in Table 6 (face-to-face, online – not MOOC – and MOOC) within the context of HRD. In other words, the knowledge assimilated during a course, traditional (e.g. face-to-face) or not (e.g. via a MOOC) must be applicable and relevant for day-to-day business activities. In addition, having the capacity to increase a large number of employee´s professional knowledge simultaneously via up-to-date and high quality course materials was considered important by interviewees regardless of whether the training was delivered face-to-face, online or via blended models. Additionally, it was frequently underlined by the interviewees that online training and MOOCs should be complementary to traditional face-to-face training/education. In other words, MOOCs and other types of online course can offer further professional development opportunities, particularly as they are functional and interactive. Whilst interviewees perceived the development of skills to be the main objective of all types of course, it was noted that there is the possibility of increasing digital literacy via online education and training. Interviewed organizations argued that HR development courses are a way to enhance lifelong learning whilst integrating professional development. They bring together business related skills and information (rules, regulations and guidelines) and develop more general skills (personal development). Online courses are, in the opinion of our interviewees, more practical than traditional HRD courses. All information is available and accessible online and in one place with no need to print material. Subsequently, they are usually cheaper than traditional face-to-face courses. In addition, the platform on which the course is hosted tracks the learner’s progress whilst the learner can often access resources outside of a work context and on multiple devices (such as a mobile device), enabling study to occur at a time convenient to the learner. MOOCs were therefore perceived to have the potential to widen access to education and democratize knowledge acquisition by enabling learners to access material in multiple ways, free at the point of use and accessible 24/7. Over 30 per cent of the interviewees highlighted the need for accurate resources to be used. Around a quarter of interviewees told us they expected MOOCs to be the future of the education system. Table 6. 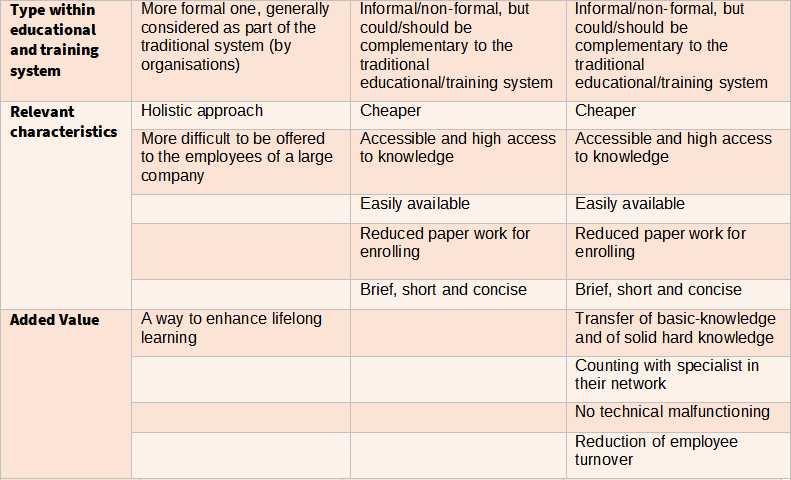 Expectations of organisations from training courses by type. Source: BizMOOC based on in-depth interviews. Six of the interviewed organisations stated that MOOCs had the potential to generate additional value to organisations, if they employed a user-friendly interface and, if possible, were offered in local language (due to the highly varied foreign language and IT skills of employees). Facilitate rapid and efficient lifelong learning. However, the interviewees also highlighted some issues that deserve attention. Selecting the most appropriate MOOC from the wide range of courses available can be challenging. The reliability of the knowledge shared within the MOOC, the means for an employer to monitor a MOOC and the validity of the certificates (if offered) are other aspects that seem to concern organisations. According to one of the interviewees, MOOCs could be perceived as inflexible, particularly in instances where automated responses to questions are used, in comparison to being able to ask a facilitator/educator. However, solutions such as chat functions were cited as possible workarounds. When it comes to benefits, MOOCs were considered by interviewees to facilitate easier access to university learning materials due to their flexibility and time saving potential. It could be also a good method of building confidence of learners (students, employees and even unemployed people). According to the interviewees, MOOCs are hardly offering greater employability benefits to those who have never had a formal job or are low educated. Prior knowledge is required to increase the chance of completing this type of course. Five of the interviewees were unsure that unemployed people would use MOOCs except in instances of career change or when looking for employment. Nevertheless, MOOCs could offer many potential learning opportunities for unemployed persons, particularly those courses that focus on more general transferable skills. Whether certificates of completion or badges offered by MOOCs are formally recognised or considered as valid additions to a curriculum vitae (CV) was also a concern raised by interviewees. According to our research, if a potential employee had completed a MOOC, this was not currently viewed as giving him/her “the edge” over other candidates. Interviewees also perceived the potential to increase one’s network both virtually and face-to-face and the possibility of engaging with specialists and using up-to-date material as highly valuable aspects of MOOCs. It is of note that the organisations familiar with the concept of MOOCs, and the ones previously involved in offering/producing MOOCs, viewed employee MOOC participation as giving them an advantage over others who were traditionally certified. As noted above, over 70 per cent of the sample is involved in various capacities in online professional development, but with a rather low level of MOOC usage (only 17.86 per cent). Nevertheless, it is worth noting that the use of MOOC is largely confined to staff training (see Figure 1). A large number of organisations, mainly those already involved in online professional development activities, are interested in using MOOCs in other areas as well (i.e. brand awareness, marketing, training their staff and recruiting). Figure 1. 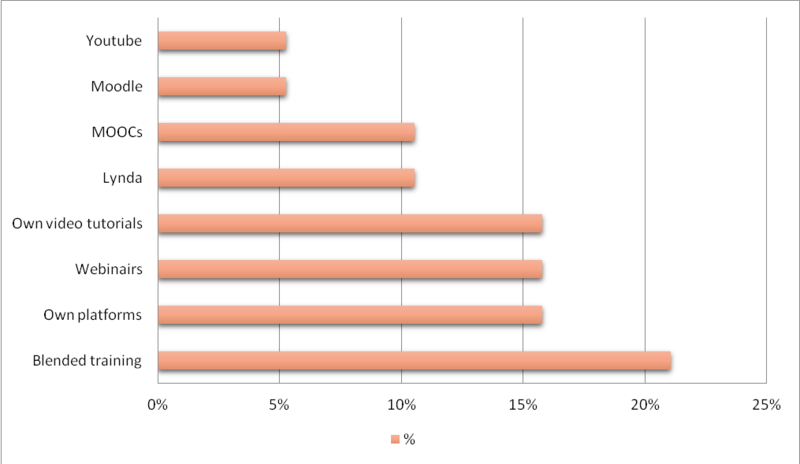 Use of MOOCs by activity type and region. Source: BizMOOC based on in-depth analysis. With the aim of testing interviewee openness to both producing and using MOOCs in the near future, interviewees were asked to indicate whether they would recommend the use of MOOCs for continuing professional development (CPD) for their own staff. Our findings are presented in Figure 2. There is no doubt that representatives of the organisations interviewed would highly recommend the use of MOOCs to their staff (over 69 per cent) with a clear preference for this approach in Western Europe (70.59 per cent in comparison to 40.58 per cent of respondents in Eastern Europe). A more equal distribution is noted in relation to recommending MOOC for CPD (70.59 per cent in Western Europe in comparison to 56.82 per cent of respondents based in Eastern Europe). Figure 2. Recommendations for MOOC use. Source: BizMOOC based on in-depth analysis. Different reasons for being involved (or not) in the production or offering of MOOCs can be seen in Table 7. Around 29 per cent of the organisations interviewed emphasised the time saving possibilities, creating networks and lowering costs. Table 7. Reasons for organisations (not) being involved in offering/producing MOOCs. Source: BizMOOC based on in-depth interviews. The main reasons for offering/producing MOOCs as stipulated by the interviewees were the possibility of offering a practical solution for multinationals, the improvement of corporate and individual skills and a better methodology than other types of training and education. Among the reasons of not being involved in offering/producing MOOCs, legal limitations, low awareness, lack of experience and the lack of capacity to offer this type of course were noted by interviewees. Apart from the cons presented in the Table 7, other barriers were identified during the research. Many organisations are using training sessions to evaluate their employees´ performance. This could be an inhibitor of building confidence of the employees. Moreover, in some organisations there is a strong stigma regarding the validity of eLearning due to prior negative experiences. It seems that low cost or even free courses are not necessarily associated with high quality according by some of the interviewed business representatives. There are therefore a number of issues to be addressed in order to increase engagement with and use of MOOCs. In addition, some groups of employees are not digitally literate, Internet access is patchy in some regions and some individuals are more experienced in learning online than others. The self-directed nature of MOOCs and the perception that MOOCs are tackling mainly contemporary topics, but not necessarily core business competencies, is not helping to increase the number of institutions involved in offering/producing MOOCs. Moreover, confidentially issues were considered a particularly critical barrier to be addressed by many of the interviewees. Interviewees were asked what the primary reasons for collaboration with higher education institutions (HEIs) or other organisations would be and what subject areas MOOC collaboration could focus on. More than 64 per cent of the interviewees are interested in collaboration with other institutions in offering/producing MOOCs. Primary reasons for this kind of collaboration in addition to the type of topics these MOOC could cover are shown in Table 8. Twelve key reasons for collaborating with HEIs with a view to offering/producing MOOCs were identified from the analysis: Branding, attracting the best future employees, enriching knowledge in specific areas and updating, sharing knowledge on specific areas, marketing, capacity to contribute to MOOC content, improved strategic positioning of the organisation in the market, networking and bringing theoretical and practical knowledge together, etc. Table 8. Primary reasons and main topics for collaboration with HEIs in offering/producing MOOCs. Source: BizMOOC based on in-depth interviews. Interviewees offered the following list of topics for collaboration: compliance (especially focused on health and safety, and fire prevention training), quality management, finance and risk management, advertising, standardization processes, branding-marketing, and other related issues. How could champions/ambassadors increase awareness of MOOCs and public recognition? Through social media platforms and targeted marketing. What would an evaluation framework do? How could HEIs/organisations/governments improve usage of MOOCs? By actively contributing to regional/national policies and initiatives that would encourage a range of organisations to become involved in the use and production of MOOCs. The BizMOOC project will produce, promote and facilitate three MOOCs. Each MOOC will address key business and lifelong learning competencies within the European context and cover learning to learn (through MOOCs), sense of initiative and entrepreneurship. These topics have been chosen, because they directly address two competences (of special relevance for the world of business) out of eight key competences for lifelong learning recommended by the European Parliament and The Council (2006). With these topics in mind, it was therefore important to ascertain from the interview participants which skills they thought were vital to their business interests over the coming years. Among the most relevant competences and skills noted by interviewees, digital competences, managerial education, change and project management were perceived as particularly pertinent. 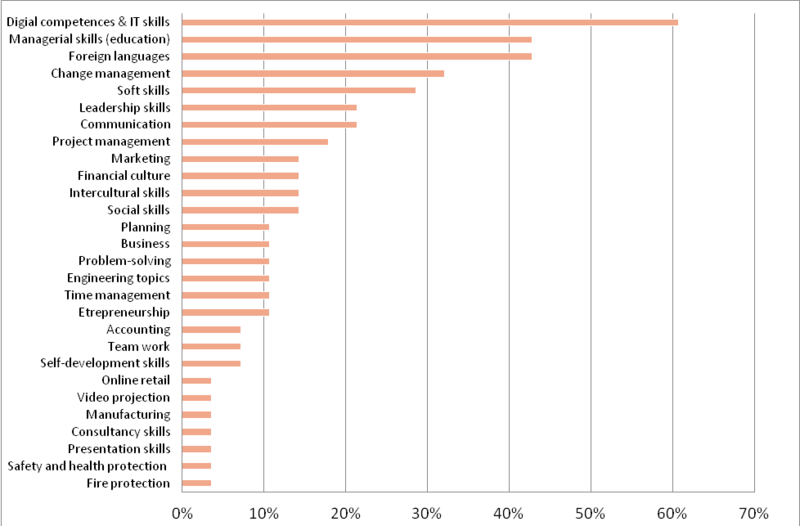 Language skills, soft skills and leadership and communication were also considered key skills for successful business activities (see figure 3). Figure 3. Key skills considered by the organisations interviewed. Source: BizMOOC based on in-depth analysis. Before exploring the skills identified by interviewees, our research identified further detail on the added value of MOOCs. These results are presented in Figure 4. As can be seen there, the most attractive aspects of MOOCs are the characteristics “open, free, massive, scalable, without entry requirements, interactive and collaborative method for training/education”. The characteristic of “openness” was identified as bringing the most “added value” by over 70 per cent of the interviewees. Figure 4. Added values of MOOCs. Source: BizMOOC based on in-depth analysis. Other identified important aspects of MOOC were their free provision (more than 55 per cent), the large number of participants (40 per cent), the quality of the learning materials (31 per cent), their scalability, the abundance of entry requirements, the collaborative element and the flexibility (between 25-28 per cent). One participant in the interviewing process questioned whether the large number of participants were an “added value” or whether they were actually a disadvantage as large participant numbers may have negative consequences on the quality, assessment and recognition of this kind of course. 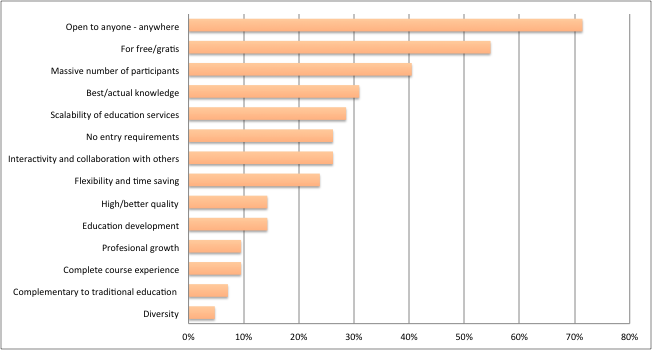 The most relevant online training subjects for the organisations interviewed were IT skills and management skills. Only 20 organisations offer an eLearning division within their institution, the majority being located in Eastern Europe. These organisations highlighted the most relevant areas of their eLearning divisions as shown in Table 9. The focus of eLearning in these institutions is on both soft and technical skills. Table 9. eLearning areas tackled by eLearning divisions. Source: BizMOOC based on in-depth interviews. In the interviews we also discussed the most frequently used tools for online training. As it can be seen in Figure 5, a blended training approach is used most frequently by these organisations. Regarding online learning methods an institution’s own platforms, webinars and video tutorials are all used at similar levels. Moodle and Youtube videos are used by relatively few organisations, even in comparison to MOOCs (see Figure 5). Figure 5. Tools used for online training. Source: BizMOOC based on in-depth interviews. It is worth mentioning that Lynda (Lynda is a US-based online educator, who designs video courses in the areas of software, creative, and business skills. Courses are taught by industry experts.) and MOOCs are currently used by only a small number of organisations from the BizMOOC sample. These tools remain largely used by multinationals or by IT companies. Our research shows that a rather low number of the BizMOOC sample is familiar with MOOCs, but more than 94 per cent agree with the definition offered, with some interviewees offering suggestions for furthering that definition. More than 71 per cent of the organisations interviewed are already involved in online professional development, especially in Western European countries. Yet less than 20 per cent of those interviewed are involved in producing or using MOOCs. There is therefore room for improvement, particularly when comparing Eastern and Western Europe. Education is becoming more personalised: from face-to-face courses to open and online offerings, technology can facilitate the sharing and exchanging of experiences. As one indicated in the interview of one large organisation, MOOCs in general are a good way of offering learning opportunities, largely due to the “human factor”. For example, fora offer students from around the world the opportunity to interact and learn together; potentially creating a learning community. MOOCs were considered by interviewees to be complementary to the traditional training/education system. According to McPherson & Bacow (2015), there is an increased interest in blended or hybrid concepts (e.g. the use of both face-to-face and online learning in a course). This could be an advantage for enlarging the awareness of MOOCs underlining their benefits and cost efficiency. MOOCs have the potential to widen access to education, particularly in a climate of where the role of education is under question, there is an increase in unemployment and funding cuts are impacting on resources. Interviewees highlighted a number of opportunities for the use of MOOCs within a corporate context. In particular, MOOCs were viewed as particularly useful for HRD, customer training or as a marketing and recruitment tool. 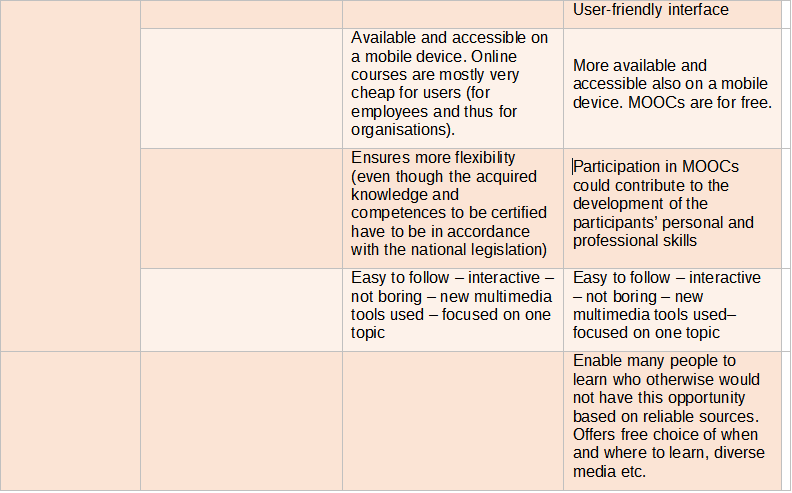 Some of these tools would need to be created by the organisations themselves whilst others could utilise existing MOOCs. The creation of MOOCs depends on available resources, existing training structures and a willingness to examine the possibility that MOOCs could offer the organisation. 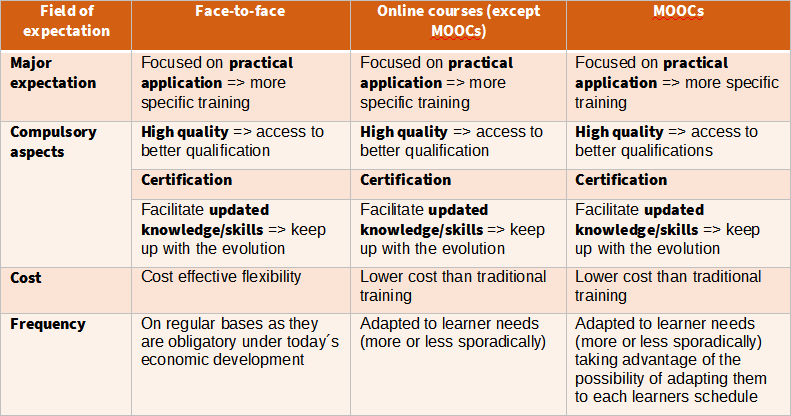 When taking into account the differing levels of the use of eLearning in organisations, it is clear that MOOCs have the potential to complement traditional face-to-face offerings, particularly in, but not limited to HRD. Further MOOCs for business need to be focused on practical activities relevant to the organisation concerned, be up-to-date and reflect current best practice. Another expectation was that MOOCs could help building confidence of learners (students, employees or unemployed). A number of interviewees highlighted that MOOCs currently appear to offer no employability benefits to learners who have never had a career or have a low level of education. However, MOOCs were perceived as potentially widening the network of learners in addition to providing quality and up-to-date information, which could make a difference when looking to apply for a job or advance one’s career. MOOCs are not just a way of offering employee training free at the point of use, but also provide a complementary tool for higher education, vocational education and lifelong learning as well as a complementary education tool that might facilitate continuous development of the employees. MOOCs can be used by secondary schools, at work, within lifelong learning contexts etc., but should also be used to educate at scale and could be used for public service announcements and as a tool for businesses to engage with their customers and potential customers. MOOCs are suitable for large organisations that have offices in multiple locations. In the instance of small to medium sized organisations, MOOCs could be a way of ensuring up-to-date training as offered to employees in instances where there is limited or no available budget for training, or no HRD/eLearning unit. Findings from the interviews showed that a large number of organisations are considering MOOCs as a way of training their employees, particularly in health and safety where standards are informed European legislation and therefore training materials can be easily reused in different contexts. However, creating MOOCs on health and safety would need to involve expertise and services that would initially need to be paid for. Regarding the potential collaboration between HEIs and businesses, a number of topics were highlighted covering both soft and technical skills. However, to enable potential collaboration between these two sectors, work would need to be done to address prior negative experiences of eLearning and the association of free of charge courses as being lower in quality. Other issues that need to be addressed include digital literacy, Internet connectivity and a lack of experience with online learning. In addition, perceptions of existing MOOCs as not addressing core business competencies, but being focused on “trendy” topics (such as e.g. artificial intelligence – however, the authors of this paper observe a strong shift towards business and management topics offered by MOOCs; for example, Class Central (2017) lists at the time of writing this report 1.125 business & management courses, almost twice as much as topics in other categories), privacy concerns and existing policy around eLearning and training were also cited by participants as possible barriers to collaboration between HEIs and businesses with regard to MOOC production and use. To enable collaboration between businesses and HEIs, the role of regional/national legislation and initiatives to promote MOOC use/creation could be useful. Initiatives would contextualise, promote and incentivise collaboration and endorsement from regional and national government would help strengthen and reveal the relevance of MOOC to businesses. Broom, A. (2005). Using qualitative interviews in CAM research: A guide to study design, data collection and data analysis. Complementary Therapies in Medicine, 13: 65-73. Bryman, A. (1988). Quantity and Quality in Social Research. Unwin Hyman, London. Bryman, A. (1989). Research Methods and Organization Studies. Unwin Hyman, London. Fasihuddin, H.A., Skinner, G.D., Athauda, R.I. (2013). Boosting the Opportunities of Open Learning (MOOCs) through Learning Theories. Journal on Computing, 3(3): 112-117. Grossman, R. (2013). Are Massive Online Courses in Your Future? Organizational and Employee Development Special Report, SHRM, August 1. Iversity (2015b). KPMG und iversity: Online-Kurs zur Zukunft der digitalen Weiterbildung. Retrieved from https://iversity.org/de/pages/kpmg-corp-digital-learning. Radford, A.W., Coningham, B., Horn, L. (2015). MOOCs: Not just for college students-How organizations can use MOOCs for Professional Development. Employment Relations Today, 41(4): 1-15. Sreeleakha P., and Manikandan, N. The Way Forward with MOOCs – Professional Development Perspectives. American International Journal of Research in Humanities, Arts and Social Sciences, 15-514: 29-32. Wai-chung Yeung, H. (1995). Qualitative Personal Interviews in International Business Research: Some Lessons from a Study of Hong Kong Transnational Corporations, International Business Review, 4(3): 313-339. Again, Class Central recently announced, that MOOCs finally become “big business”, based on announcements by big players such as Udacity and Coursera. But is this true for all institutions or only the big players?